The market place in King's Lynn is one of the most impressive open markets in England. 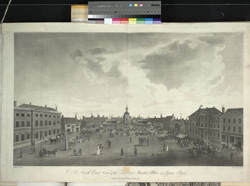 This picture shows the grand Market Cross, a domed octagonal-shaped building, built between 1707 and 1710 and now demolished. Other historic buildings in the scene include the Duke's Head hotel, built 1683-9; the Mayden's Head hotel, which dates from the 16th century; and the 18th-century Globe hotel. Daniel Defoe thought Lynn a "rich and populous thriving port-town", noticing that "there is in the market place of this town, a very fine statue of King William on horseback, erected at the charge of the town."